After enabling EMET on the Internet Explorer executable iexplore.exe and testing again this time broke the exploit. Disabling the mitigation feature “Export Address Table Access Filtering” (EAF) on the process now exploited successfully proving that’s EMET’s EAF was mitigating the shellcode from execution. In order to do something “useful”, shellcode generally needs to call Windows APIs. However, in order to call an API, shellcode must first find the address where that API has been loaded. To do this the vast majority of shellcode iterates through the export address table of all loaded modules, looking for modules that contain useful APIs. Typically this involves kernel32.dll or ntdll.dll. Once an interesting module has been found, the shellcode can then figure out the address where an API in that module resides. This mitigation filters accesses to the Export Address Table (EAT), allowing or disallowing the read/write access based on the calling code. With EMET in place, most of today’s shellcode will be blocked when it tries to lookup the APIs needed for its payload. 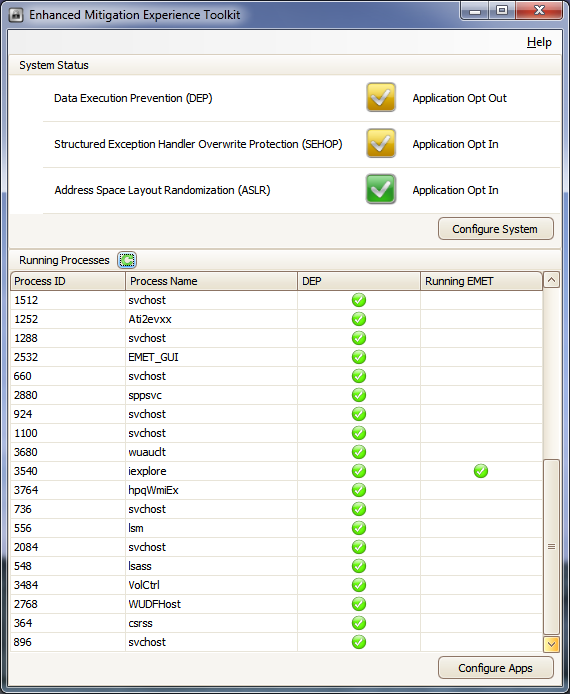 I see EMET’s EAF being a great feature as even having a system that supports DEP and ALSR, EAF will be another hurdle to get round to exploit successfully. Berend-Jan Wever wrote an article last year showing how to bypass EAF but I thought I’d write my own custom shellcode to bypass EAF. For this example I’ll use the RemoteExec exploit published in my last post. Soon as I protected RemoteExec.exe with EMET my existing exploit broke so my new shellcode will now call the required API’s directly. Below is my custom asm code which downloads and executes box.exe which I started first with static addresses . The addresses used in this asm code are from a Windows XP SP3 machine. Below is my completed shellcode that can be used on RemoteExec for Windows 7 with EMET enabled on the process. The key to this exploit was that we had obtained our kernel pointer in our last exploit which then we worked out the VirtualProtect API address and stored it in ESI. With this in mind I used the value of ESI and calculated our API addresses, LoadLibrary, URLDownloadToFileA, WinExec, etc. EMET is superb tool to have installed and would recommend it to anyone as it will mitigate a number of shellcode based exploits. One thing I would like to see in EMET is the ability to alert the user or have some sort of logging to tell us if shellcode was encountered. This would be useful to discover 0-day exploits out there if we inadvertently got hit by a drive by attack.